Imani L. Hawkins is pleased to present the release of her newest book, From Darkness! Check out the stunning cover and blurb below! Also, get to know the author with Imani’s bio, author interview, and social media links. And last but not least, enter for a chance to win a signed paperback copy of From Darkness plus a huge gift basket filled to the brim with goodies! A war between humans and angels is coming, and only one woman can stop it. Myleah is one of the Fallen, angels shrouded in darkness and cast to earth. When some of her kind, the Council, gain control over the human population of Burnsville, Nevada, Myleah is caught in the middle of spiraling hostility between her former lover, the Fallen, and the original angels of heaven. Only by embracing the darkness within her can she become strong enough to prevent the impending war and ensure the survival of humans and Fallen alike. But by doing so, she will risk losing the man she loves, and maybe even her very self. Imani L Hawkins is a writer of all things supernatural, paranormal, and urban fantasy. Growing up in New Mexico, the land of enchantment, she’s always surrounded by beautiful scenery that inspires most of her tales. Caring for her two children with the support of her loving husband, she’s found the courage to write stories filled with intricate plot lines and characters she’s sure anyone would be able to relate to. A love of all things creative, she spends her free time playing the alto saxophone, making designer soaps, painting, playing around with digital design, and writing stories she hopes will inspire others. She loves hearing from people who enjoy her stories. So, feel free to follow her on social media, subscribe to her newsletter, or simply send her an email! At what age did you begin writing? Most people won’t believe me, but I penned my first short story at the age of 6. The librarian at my elementary school still had a copy of it when I returned back to my hometown at the age of 23. Are there any authors or books that have had a positive influence on your life? There are a few. The first would be Sid Fleischman. He wrote The Whipping Boy which was the first book I’ve ever read on my own. Being bullied in the first grade was difficult, and I was obsessed with this book and the way it pulled me into another world, allowing me to live through the characters instead of facing my own reality. I thought, if a simple book could provide me with an escape, maybe I could contribute by telling stories of my own. What do you think is your greatest strength as a writer? What is your greatest weakness? What is your book From Darkness about and what inspired you to write it? From Darkness is a book centered around a fallen angel named Myleah. The Fallen, ruled by a council, have taken over the city of Burnsville, Nevada, and plan to work their way through all the major cities until they’ve succeeded in taking over North America. 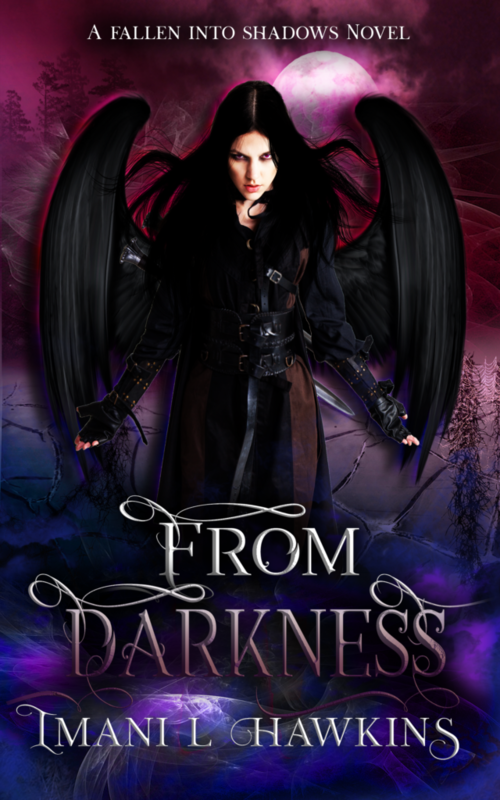 In From Darkness, Myleah is an outcast, tossed from the world of the Fallen when they discover she’d lost her wings. When a fallen angel is killed by another, she is brought back into the fold to uncover the mystery behind the angel’s death. What she uncovers changes everything she’d believed before, and she is forced to embrace her darkness to save the humans and the Fallen from the council. This story was inspired by my husband. While writing my dream story and looking at my husband, Tyrin was born from a simple thought and an active imagination. The original plan was to write out Tyrin’s story with Myleah’s story written as a follow-up series. Myleah just happened to come alive on the page and demand to be written first. Seventeen years. I’ve spent so much time in front of a computer writing and rewriting that story, never really able to complete it until, finally, I decided to pursue my publishing goals. Do you have any advice for other authors? For example, things you would recommend or pitfalls to avoid. Did you learn these methods via experience or study? Simply write. Block out all the negative noise that comes with putting yourself out there and simply write your story. Negative people, self-doubt, and life will always get in the way, and you have to find a way to push through all of it and write YOUR story. Don’t stop and don’t let anyone read it until you are finished. A common problem most people have is that they allow obstacles to keep them from doing what makes them happy. That is especially true with writing. You may not be the biggest ‘grammar nazi,’ or the best at describing characters or settings, but you will improve the more you write. So keep writing. The reason I say don’t let anyone read it until you are done is simple. From experience, I find that people will instantly critique something without having the entire picture, and, for me, I may change the direction of my story based on that critique. Soon, the story is no longer mine. It is a collection of ideas from people who never got the real story. This is the best advice I can give right now. Do you have a special time of day or even a special writing space where you feel more inspired to write? Most would find this odd, but I dwell in chaos! I have a three-year-old and six-year-old who are constantly running around and making noise. That, combined with the constant noise from the television actually provides the best environment for me to write. Without the chaos, I find that my mind wanders too much. I don’t really consider myself a funny person but I will say this. Tyrin, the male counterpart to Myleah in From Darkness, is actually modeled after my husband. Tyrin is also Myleah’s love interest. Writing the two of them together was difficult at times because I found myself getting jealous of Myleah! While building their romance, I found myself shying away from them touching or kissing because, in my head, I am always picturing my husband when I’m writing their scenes. And no one is allowed to touch my husband but me! Next, I will be writing Fallen: Fallen into Shadows Book Two. Along with that, I am collaborating with good friend of mine on a story involving ancient Egyptian God Set. Grab your copy of From Darkness for your chance to win! Enter to win a signed paperback of From Darkness, plus a huge gift basket filled with goodies! One signed copy of From Darkness, 10 bath bombs, 2 bars of luxury soap, 2 jars of whipped lotion, 1 bubble bar, 1 sugar scrub, 2 body sprays, 2 candles, 2 champagne glasses, 1 foot scrub, 3 foot soak bombs, 2 large towels, and 1 sponge. Plus, there are several other ways you can enter, including some daily tasks!